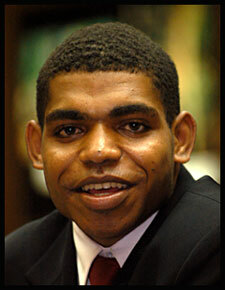 Septinus George Saa was born in Manokwari on 22 September 1986. Since childhood, he often moved around to follow the lives of his parents. In fact, he often lived apart from their parents. He is a winner of the First Step to Nobel Prize in Physics in 2004 from Indonesia. His paper titled Infinite Triangle and Hexagonal Lattice Networks of identical Resisto. formula even counter resistance between two points given a series of resistors that discovery of his own name as "George Saa Formula". Achievements of young people aged 19 years is very impressive. Finding a formula that has won a First Step to Nobel Prize in Physics that it outperformed hundreds of papers from 73 countries who entered the judges' table. The jury consisting of 30 winners from 25 state physics it only takes three days to break the 17-year-old boy was carried off the gold Jayapura. Oge was born from a simple family. His father, Silas Saa, the Forest Service Chief Teminabuhan, Sorong. Oge farmers prefer to call her father rather than employees. Therefore, to meet the needs of daily living, Silas, assisted by his wife, Nelce Wofam, and their five children, had to cultivate the fields, plant the tubers. Silas inherited a fifth child keenceran brain. Silas is a graduate of Forest High School in 1969, a high level of education for Papuans at the time. Apulena Saa, eldest daughter of Silas, following in the footsteps of his father. He is a graduate of Bachelor of Forestry university. Franky Albert Saa, the second son, is currently taking Master of Management Program at the university. Yopi Saa, a third son, is a medical student Christian University of Indonesia, Jakarta. Saa Augustine, the fourth son, a student of Faculty of Forestry, State University of Papua, Manokwari. While the Youngest, Oge, won gold on the international stage. "All children are not spoiled mama with money, because we do not have the money," said mama Nelce after accompanying his son to receive an award from the Department of Forestry, Tuesday (06/22/2004), the Ministry of Forestry, Jakarta. He recalled, because of the lack of family economy, Oge frequently absent from school when elementary to junior high. Distance from home to school about 10 miles. Oge had to take a "taxi" (public transportation) at a cost of Rp 1,500 each way. That means Rp 3,000 round trip. "I can not snack. To ride "taxi" mama just often do not have money. If you want to eat Oge had to go home, "he said. For Oge achievement is not necessarily because of money. The young man known as the playmaker on the basketball court are people who are hungry to learn. There is always a way for people who are hungry like Oge. His achievements in the field of physics not only because he is fond of science, according to some young people of this complex. "I'm interested in physics since junior high. There is nothing special why I like physics because basically I love to learn it. Forget it said physics, I love to learn everything, "he said. "All my subjects in school rather than Civics (Pancasilan Education and Citizenship). Lessons were boring and too many notes. I like the chemistry, history, geography, mathematics, especially the Indonesian language. I have always been good value for Indonesian, "he added. After elementary and junior high school is often marked truant, Oge received at SMU 3 Buper Jayapura. It is the government's flagship schools that ensure all students' needs, ranging from uniforms, pocket money, to the dormitory. Intellectual thirst like finding an oasis here. He began to recognize the internet. Of this virtual universe he gets all kinds of theory, findings, and results of research the world of physics experts. Brain brilliance of black pearls from eastern Indonesia is starting to shine when in 2001 he won the race Chemistry Olympiad local level. Because of his achievements, he received a scholarship to Jakarta from the Government of Papua Province. But her mother forbade her youngest son went to the capital city. Achievement seems to need a bit of mischief and recklessness. Assisted by his brother, Frangky, Oge leave quietly. He had told his intention to mommy dearest just before boarding the plane. His mother cried for two weeks to realize her son to leave the land of Papua. November 2003 he was ranked eighth of 60 quantum mathematics contest participant in India. Her achievements culminated this year with gold holding physics research. His mother was not crying anymore. "I want to be a scientist. Actually science is to make life easier. Science and technology that make human life comfortable. I hope that I became a scientist, I can make human life more comfortable, "he said. In Jakarta, he was specially trained by Mr. Physics Indonesia, Professor John Surya. Early November 2006 he had presented the results of his research in front of physicists in Poland. He must prove that his research on the resistor nets a matter that is the original idea. After that, he will have the opportunity to learn research at the Polish Academy of Science in Poland for a month under the guidance of topnotch physicist. After receiving the award, George was given a lot of facilities. Then education minister, Malik Fajar, asks George to choose any university in Indonesia without a test. College campus where he was also obliged to provide learning facilities. George was confused to choose the campus before the delegates the Executive Director of Freedom Institute Rizal Mallarangeng went to him. '' I asked to see Mr. Bakrie,'' said the man was born 22 September 1986. George Freedom Institute offers study abroad. Choose any country will be granted. Want in the Americas, Europe, Africa and even once, it's up to George. The scholarships are not just tuition, but also the cost of living allowance as well. Men's basketball hobbyists got confused to choose the country. Rizal Mallarangeng suggested that he chose America. Therefore, the leadership of Barack Obama is good for studying and doing research. George then apply to the department of aerospace engineering at the Florida Institute of Technology. Campus on the east coast of America in Brevard County. The campus is adjacent to the Kennedy Space Center and the launch aircraft NASA (National Aeronautics and Space Administration). Majoring in aerospace engineering aerospace engineering alias, George learned all about the plane, the plane flew in space and outer space. He also studied the aerospace supersulit in the universe, which is rocket science. '' Because of the difficulty, the Americans often say, you do not need rocket science to figure it out,'' he said, then chuckled. Among the 200-student's contemporaries, only 40 people who graduated. George learned all about airplanes. Start the aircraft structure, aerodynamics, lift, weight efficiency of the technology to manufacture the steel birds. Any particular reason he likes airplanes. In addition to admire is the third president of Indonesia BJ Habibie is devoted to the aircraft, the stocky man originally wanted to become a pilot. However, because both eyes minus 3.25, he must turn his dreams. '' If you can not fly a plane, I should be able to make the plane. At least, understanding aircraft technology,'' he said. America's first year was very difficult for George. Because, he is not fluent in English. Once, he held an hour in the immigration. '' I just sit and be quiet for an hour because no English,'' he said. Therefore, the first year, George was straight on to college. He studied English language school English Language Service in Cleveland, Ohio state, USA. For a year he raced to learn the language. From 08.00 until 17.00 hours, he ate English language materials. '' I learned more grammar and vocabulary,'' explained the couple's youngest son Silas Saa and Nelly Wafom it. George graduated in late 2009. Now, he works in an international company engaged in oil and gas while help out at the institution that gave scholarships, Freedom Institute. '' Three weeks I've been in Jakarta. Next to the sea again,'' he said.